The term “worldview” is thrown around a lot in evangelical circles—especially in the world of Christian education—but very rarely is it defined with any care or precision. Much less do many Christians realize just how controversial it is. After all, the term doesn’t come from Scripture or even from Christian theologians, but rather from modern secular philosophers. So is it even appropriate for Christians to make use of this concept? And if not, what alternative are we left with? If we shouldn’t speak of Christianity as a worldview, then how should we speak of it? Here I’d like to offer an explanation and defense of the idea of a Christian worldview. It may be helpful to begin by tracing its historical origins and development. Most agree that the first thinker to speak of “worldview” was the German Enlightenment philosopher Immanuel Kant (1724-1804), who used the German term Weltanschauung. Kant took a more rationalist approach to worldview, claiming that there is one correct worldview at which we could all arrive by the right use of autonomous human reason. Other non-Christian thinkers soon started using the term in different ways. Wilhelm Dilthey (1833-1911) took a more irrationalist stance in his claim that all worldviews are historically and culturally relative, and therefore no worldview can be considered better or worse than another. A key element of Dilthey’s understanding of worldview is that it is pre-rational; that is, we don’t reason to a worldview, but rather from it. This means that a worldview cannot be established or falsified by science or philosophy. It has to be taken on faith. Kuyper believed that there was a uniquely Christian way of doing art, science, education, politics, etc.—and this uniquely Christian approach to life formed an antithesis to all competing non-Christian worldviews. Credit for popularizing the idea of a Christian worldview among evangelicals in North America undoubtedly goes to Francis Schaeffer (1912-1984), who founded the L’Abri community in Switzerland and wrote extensively on apologetics, art, and culture. Schaeffer had a profound impact upon the following generation of evangelicals, including Nancy Pearcey and Charles Colson (see How Now Shall We Live?) and James Sire (see The Universe Next Door). These evangelicals all affirmed the two key insights of Orr and Kuyper: 1) that the Christian faith forms a unified and coherent vision of all of life, and 2) that this vision stands in irreconcilable opposition to all competing non-Christian visions of life. It’s also worth mentioning the influential work of Catholic philosopher Charles Taylor (1931-) and his Reformed evangelical disciple James K.A. Smith (1970-). These philosophers have taken the idea of worldview in a more tacit and aesthetic direction. They prefer the term “social imaginary” to “worldview,” placing greater emphasis on how our communities, habits, and imaginations shape (often in quite imperceptible and inarticulable ways) our vision of life and human flourishing. In other words, human knowing doesn’t necessarily begin with words. A worldview, then, is a semiotic system of narrative signs that creates the definitive symbolic universe which is responsible in the main for the shape of a variety of life-determining, human practices. Worldview is an articulation of the basic beliefs embedded in a shared grand story that are rooted in a faith commitment and that give shape and direction to the whole of our individual and corporate lives. Metaphysics: what is the nature of ultimate reality? Ethics: how should we live? Aesthetics: what is beautiful? Tragic? Funny? Creation: where do we come from? Fall: what’s wrong with the world? Now if we were simply to define a worldview as the set of answers that a person gives to these questions, there wouldn’t be much debate. It should be obvious that everyone lives their life by a certain set of core beliefs, either implicitly or explicitly. But there are two key questions on which serious debate centers: 1) how does one arrive at a worldview? and 2) to what extent do so-called “worldview beliefs” impact other beliefs, especially in the realms of common human activity and experience—for example, does it really make sense to speak of a distinctively Christian view of plumbing and politics? As mentioned above, Dilthey claimed that worldviews are pre-rational. If one were to imagine the whole collection of one’s beliefs as a pyramid—with each level representing a set of beliefs that are rationally justified by lower, more basic beliefs (for instance, I believe that abortion is wrong because I believe that all human life is sacred, and I believe that human life is sacred because I believe we’re made in God’s image)—then one’s worldview beliefs would rest at the base of the pyramid. In other words, worldview beliefs aren’t justified by other, more basic beliefs; they are themselves the justifiers. This is a more contentious claim, and in some respects it’s a very modern claim. In the classical/premodern period (ranging from ancient Greek philosophers like Plato and Aristotle to medieval theologians like Thomas Aquinas), it was generally believed that there exists a common set of axiomatic, self-evident “first principles” of human reason, by which anyone ought to be able to arrive at a proper understanding of the world. 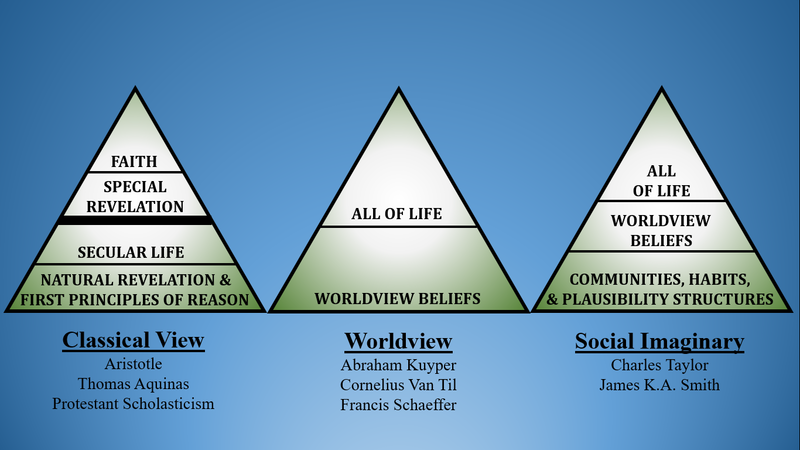 In other words, the beliefs I have called “worldview beliefs” were not seen to rest at the bottom of the pyramid, but rather somewhere further up. This would mean that every person—believer and unbeliever alike—starts at a common rational foundation and should (if they are thinking rightly) arrive at the same set of higher-level beliefs. This sounds a lot like Kant’s rationalistic take on worldview, or what the modern philosopher Thomas Nagel has called a view from nowhere. That is to say, the classical view supposes that the task of philosophy is (or at least can or should be) fairly objective and free from bias. Another consequence of the classical view is that it tended to insulate one’s religious faith from other areas of thought. For example, if I can arrive at a proper understanding of ethics without the aid of special revelation, then my personal opinions about Jesus should have little to no relevance for my views on plumbing or politics. This is why the classical view resulted in a number of conceptual dichotomies, such as nature/grace, secular/sacred, reason/faith, philosophy/dogma, etc. Thomas Aquinas spoke of a “twofold mode of truth”—one common to all humanity and the other received by supernatural revelation—which is why the classical view has sometimes been called by its critics two-tier Thomism. In more modern times, and especially in light of the widening divide between Christians and secularists, many theologians have questioned whether such neutral ground (a realm immune to one’s worldview commitments) actually exists. Theologically, our difficulty in reasoning with unbelievers is attributable to what’s called the “noetic effects of sin”—the idea that sin distorts not only what we believe, but also how we believe. The unbeliever’s very criteria for judging truth claims have become warped by the Fall. For that reason, any appeal we make to supposedly common reason is likely to fall on deaf ears. The unbeliever is biased against the truth from the very outset. There’s no neutral public space; it’s worldviews all the way down. This does raise the obvious question, what about all those pagans who did get things right? Surely Aristotle, for example, was correct in much of what he said about God, virtue, etc., even if he wasn’t saved? The worldview proponent can happily concede this fact, but it doesn’t prove the existence of universally accessible axioms of reason. Any true beliefs the unbeliever does hold (and in principle there’s no limit to the number of true beliefs an unbeliever may hold) are attributable to common grace. That is, any truth, goodness, or beauty found among unbelievers is a gift from God, but these gifts are not given equally to all. Common grace does not entail common reason, nor can everyone be an Aristotle. Further, sometimes common grace exists on a corporate or systemic level (such as when a pagan culture rejects the institution of chattel slavery). When this happens, what might appear to some as “common sense” or “self-evident” is actually the consequence of what sociologist Peter Berger has called plausibility structures: any given society has embedded within it a network of assumptions (often unspoken or even unconsciously held) that make certain truth claims more or less believable. Sometimes these plausibility structures are shaped by elite members of society (like the great philosophers of Ancient Greece—see James Davison Hunter on the role of cultural elites in To Change the World), sometimes they are shaped by mass media and entertainment (think of the role played by Hollywood sitcoms in normalizing the homosexual lifestyle), and sometimes they are shaped by legislation (yes, sometimes laws can indeed change hearts; consider when abolition was imposed on the initially defiant American South). This fact would explain why the classical view was much easier to accept in the age of Christendom; it was simply a part of the premodern plausibility structure. It would also explain why the idea of “worldview” emerged only relatively recently. Beliefs that previous generations of Christians took for granted as self-evident have now become much more contested. The formerly unshakable foundation of Aristotelian philosophy has become subject to what Charles Taylor calls the process of fragilization: common sense isn’t so common in the secular age. So where does this all leave us? How can we commend the Christian faith if all differences boil down to irreconcilable worldviews? Is our only option to retreat to fideism—to dig our heels in, and shout as loud as we can that we’re right until people start listening? How can we be expected to persuade others without being able to appeal to common reason as our referee? Well, the worldview proponent isn’t entirely at a loss. Persuasion can and does still happen in the secular age; it just tends to happen on different terms now. For one, we should acknowledge that sometimes the old methods of premodernity do still work. Sometimes people are won over by cosmological arguments, for example. But the worldview proponent won’t chalk this up to the success of common reason, but rather to the fact that unbelievers are living on what Reformed theologian Cornelius Van Til called “borrowed capital.” Since every non-Christian worldview is ultimately inconsistent and incoherent, unbelievers cannot help but borrow truth from the Christian worldview to make sense of the world around us. And sometimes we can use that truth to point them in the direction of yet more truth. This fact points to another potential means of persuasion: we can “level the playing field” by showing unbelievers that they aren’t any rationally better off than believers. Their beliefs rest on faith commitments as well, and sometimes those faith commitments prove to be self-contradictory if applied consistently. For example, when the secularist says, “Science is the only legitimate source of knowledge,” does he/she realize that that very statement cannot be proven by science? Thus we can show unbelievers that their worldview is self-referentially absurd. This is like slapping them in the face with their own hand. Lastly, we can make use of non-rational or existential means of persuasion, like appeals to beauty or human need (I’ve written about this here). This approach is especially effective in a postmodern context, where reason itself has become so suspect. It also happens to be the way that people are normally persuaded to change their minds (see Jonathan Haidt’s work on moral persuasion in The Righteous Mind). Most people don’t come to the faith because they were argued into it, but because they intuitively feel that they need it. The rational arguments generally come afterward, as a secondary support for the faith. One final word. If it is true, as James Orr argued, that the way we view Jesus affects the way we view everything else, then it means that our Christian faith matters in every realm of human activity—including plumbing and politics. The difference between a Christian plumber and a non-Christian plumber might not be initially obvious, but the Christian plumber knows that he is plumbing for the glory of God (1 Cor. 10:31). Moreover, Christians know that, even in their most mundane activities, they can advance foretastes of God’s coming kingdom. This isn’t quite the same as “building” the kingdom or pulling heaven down to earth, but it is recognizing that our ultimate heavenly ends always orient and animate our penultimate earthly ends. The two ends (or “kingdoms,” as they are often called in Lutheran and Reformed circles) can be distinguished, but never separated. This, in short, is my defense of the idea of a Christian worldview. My hope is that believers will come to a deeper appreciation of this concept, without the fear that we are compromising with secular modernity. If we can learn from ancient pagans like Plato and Aristotle, then surely we can learn from modern men like Kant and Dilthey as well. After all, this is simply what Saint Augustine meant by “plundering the Egyptians” (On Christian Doctrine II.40). God’s truth can be found—and applied—in the most unexpected places. Here I rely mostly on two sources: David Naugle, Worldview: The History of a Concept (Eerdmans, 2002); and Michael Goheen and Craig Bartholomew, Living at the Crossroads: An Introduction to Christian Worldview (Baker, 2008). See Taylor, A Secular Age (Belknap Press, 2007); Smith, Desiring the Kingdom: Worship, Worldview, and Cultural Formation (Baker, 2009). See James K.A. Smith, “Reforming Public Theology: Two Kingdoms, or Two Cities?” Calvin Theological Journal 47 (2012): 122-137.